Here you can buy Brian Tighe and Friends knives with free shipping. Brian Tighe produces one-of-a-kind, functional and visually appealing knives of the highest calibre. His blades are the product of 25+ years of experience and extensive training in the Tool and Die trade along with a solid foundation in metallurgy, design, construction and heat treating. Brian’s latest venture with BT&F is a natural progression of his career in the custom knife world. By bringing together a team of talented craftsmen and friends, Brian is able to bring his original designs to a much wider audience at more affordable prices. 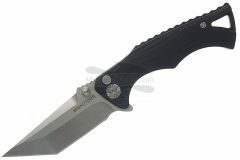 Above all, BT&F is a group of passionate makers who take great pride in producing high utility and high quality folding knives for knife enthusiasts alike.